Say, T. 1821: "An account of the Arachnides of the United States". J. Acad. Nat. Sci. Philad., 2: 59–82. Oliver JH Jr, Owsley MR, Hutcheson. HJ, James AM, Chunseng C, Irby WS, Dotson EM, McLain DK, 1993. 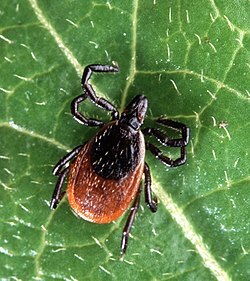 Conspecificity of the ticks Ixodes scapularis and I. dammini (Acari: Ixodidae). J Med Entomol. 30, 54-63. Wesson DM, McLain DK, Oliver JH, Piesman J, Collins FH, 1993, Investigation of the validity of species status of Ixodes dammini (Acari: Ixodidae) using rDNA. Proc Natl Acad Sci U S A. 1993 November 1; 90(21): 10221–10225.